Screen Door's Backyard Burger has a cult following, so deposing it is sort of like finding a replacement for Charles Manson. 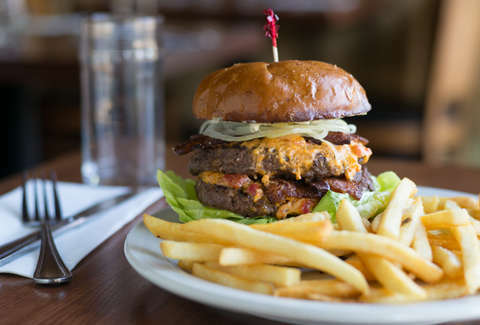 Fortunately, the new Griddlestack Burger seems to have the right blend of reason and insanity: two 5oz grass-fed beef patties that come with house-made pimento cheese, scallion mayo, lettuce, pickles, and onion. 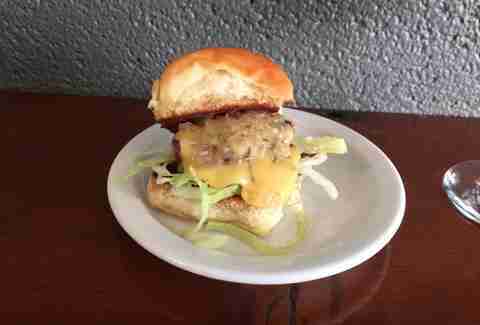 Until a few weeks ago, Biwa's Japanese-style late-night burger was harder to find than pure dimethyltryptamine. Now, every Sunday from 6pm-2am, sister-restaurant Noraneko serves the beautiful amalgamation of beef patty, barbecued pork belly, kimchi mayo, and lettuce. 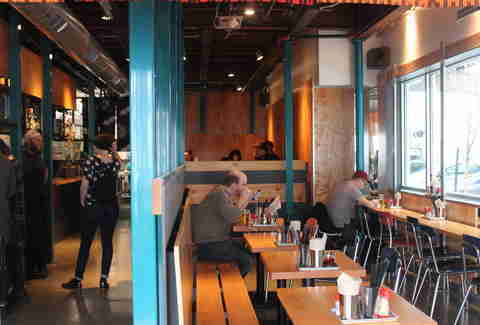 Located beneath the Hawthorne Bridge, the restaurant opened in March, and this special started mid-June. Go now, before it's gone. 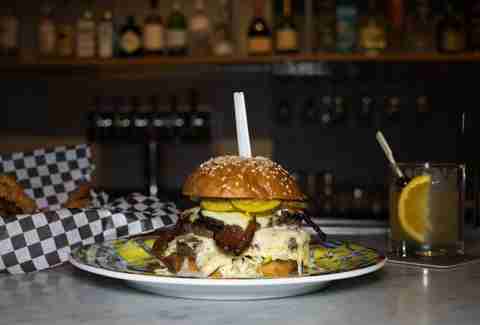 The Ltd. is one of the most over-the-top burgers to hit PDX in a while. Invented by Top Chef finalist Doug Adams, it features a wood fire-grilled 8oz patty that combines a house blend of ground short rib and house-ground Brandt dry-aged ribeye. To this succulent meatsterpiece, Imperial adds house-made steak sauce and Hook's blue cheese. It costs $24, and only 12 are sold a day (and only Monday-Thursday from 4-6pm). Thus the name. I could stop at the fact that the new slider from Chef John Gorham has house-made American cheese and was inspired by White Castle... but I won't. The creamy cheese is a mixture of Parmesan, Gruyere, and cheddar that has been liquefied using sodium citrate, and it also comes with shredded iceberg lettuce and house-made pickles. And at $4, you can basically order a Crave Case. In-N-Out expert Gabriel Rucker just released a Brie-splosion, the Double Brie Burger. Two St. Helens ground-chuck patties are individually topped with melted Brie and served on a Ken's Artisan Bakery roll with house-made Dijonnaise, spiced ketchup, onions, Mama Lil's bread & butter pickles, and iceberg-lettuce slaw. 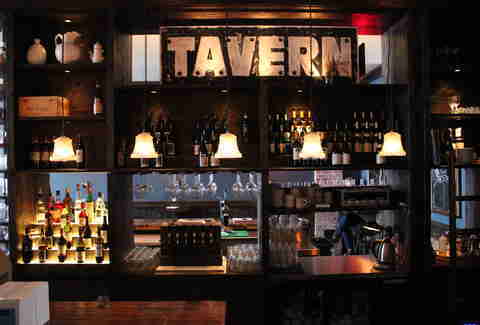 Even better, the $14 price tag is slashed to $5 during early and late-night happy hours. Since when did burgers get rationed as much as cigarettes at What The Festival? Another limited-edition burger, the "10 at 10" burger is only available after 10pm and capped at 10 burgers total each night. Here's why: American cheese, bone marrow, bacon, and caramelized onions. It's just as delicious and ridiculous as it sounds. 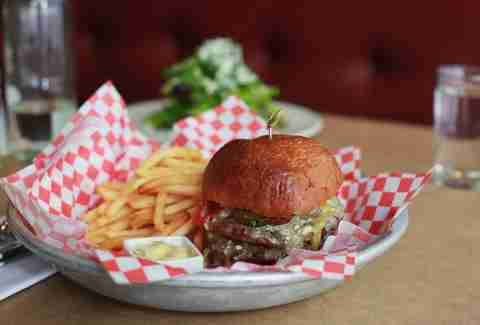 Offering the only single-cow burger in Portland, Old Salt Marketplace grinds and makes its new house burger in-house from whole carcass beef. The 100% Hawley Ranch beef patty comes on a home-baked bun with aioli, house bread & butter pickles, Ben's bacon, and Tillamook cheddar. 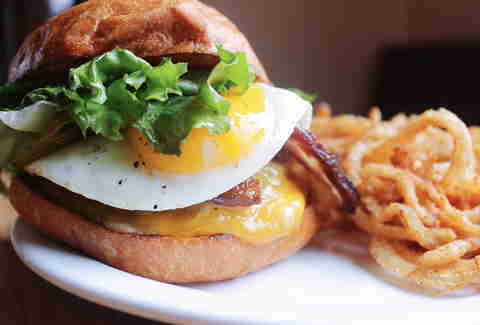 With the remodel and late-night hours comes a revamped menu with two signature burgers. Served at happy hour and dinner, the Deluxe Burger is two patties, bacon, secret sauce, white onions, American cheese, iceberg lettuce, and bread & butter pickles. Bonus: those already familiar with the diner's light and fluffy falafel find an update with the Falafel Burger, served with feta, red onion, tzatziki, cucumber, tomato, iceberg, and harissa. 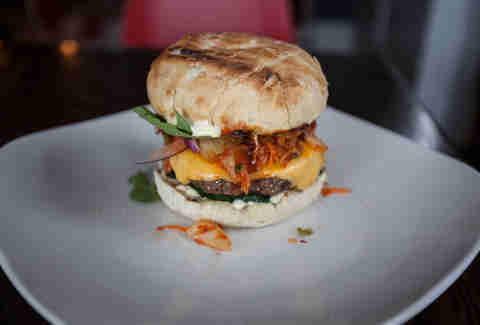 This lunch spot from Chef Johanna Ware of Smallwares opened this month and unleashed an umami-bomb of a burger: a ground-beef patty with American cheese, kimchi, hoisin, basil, cured cucumbers, mayo, and red onion. 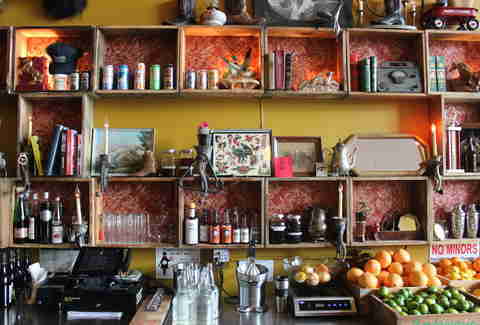 Chef Ware says that the restaurant may only be open through the summer, so get there now. Reopened after an extensive remodel, RingSide Grill at Glendoveer bucks its country-club setting with meatapocalypse burgers. 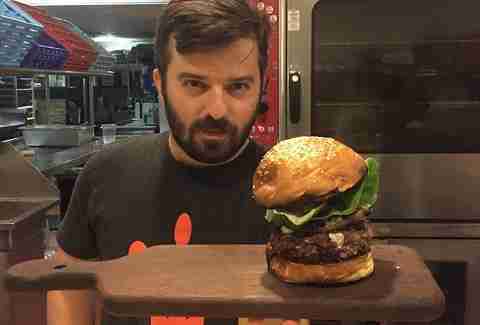 The hulking turkey burger merges Italian and "Help, Help! My tongue is on fire!" 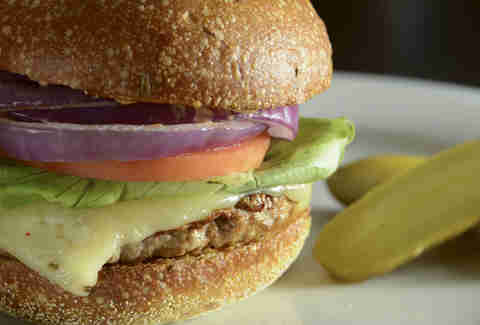 Tex-Mex, with avocado, chipotle mayo, pepper Jack cheese, pickles, butter lettuce, and tomato, all served on a rosemary bun. 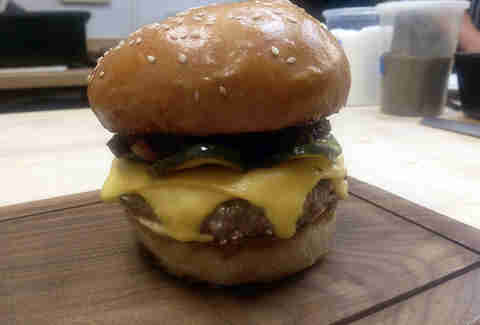 Part of a menu overhaul at downtown’s cocktail-and-meat emporium, the Olympic Burger is a 100% beef patty with bacon jam, American cheese, bread & butter pickles, and fancy sauce for $12. There's also a 6oz happy hour version of the burger for $8. Italian sister to DOC, Nonna has a burger with better Italian accents than the cast of The Sopranos. 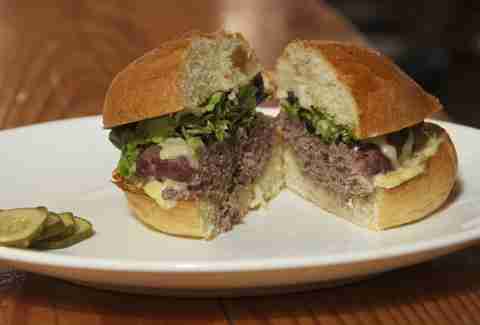 Light and olive-oily, the Nonna Burger comes with mozzarella, arugula, and pesto. Teaming up with Face Rock -- a new creamery started by one of the founding Beecher's cheesemakers -- Deschutes released the elk burger, featuring wild elk, two-year-old cheddar, and thyme aioli. In addition, the Yellow Belly Burger brings the beef, along with root beer-braised pork belly, jalapeño pesto, Portland Creamery goat cheese, and candied yellow tomatoes. Obviously, they both pair well with beer.